The Man of a Thousand Faces was born simply Leonidas Chaney in Colorado Springs, 1883. The son of deaf mute parents, Chaney began entertaining at a young age both at home and at his father's barber shop. Relying heavily on pantomime and sign language, Chaney's skills of silent communication bloomed early. He hit the acting road at the age of nineteen and performed in his first touring play, The Little Tycoon, a piece co-written by he and his brother John. In 1905, Chaney found his first wife in the form of young singing beauty Cleva Creighton, who was auditioning for a part in the traveling revue in which Lon worked. After Cleva became pregnant, the couple quit the show and returned to her hometown of Oklahoma to raise the child. But performing came naturally to the Chaneys and, after a rough stint touring the midwest in oft broken-down barnstorming shows, the three found themselves in California. There, Lon found work as a stage manager and actor, most notably for Kolb and Dill. Chaney's first film role was technically in 1912's The Blood Red Tape of Charity. During this time, Cleva survived a breakdown and suicide attempt, but unfortunately the marriage of the Chaneys had suffered too much damage to persevere and the couple were divorced in 1915. He continued to work in film steadily, receiving critical acclaim for his roles in 1918's Riddle Gawne and Miracle Man (1919). In 1923, Chaney filmed The Hunchback of Notre Dame, immortalizing the infamous Quasimodo. The master of makeup and his own special effects, Chaney wore a fifty-pound hump and bag to realistically portray the doomed bell ringer. Of course, Chaney's true immortality was sealed with his screen performance as Erik, the horrible and sympathetic opera house ghost in 1925's The Phantom of the Opera. Chaney's ingenious makeup and facial expressions perfectly captured Leroux's villain for all time. 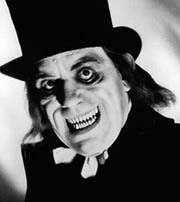 In 1927, Chaney filmed the horror-drama London after Midnight, a 'ghost detective story' in which he played the Inspector charged with investigating the mysterious goings-on and strange phantom figures at a house where the owner has supposedly committed suicide. After a career spanning eighteen years and more than 150 appearances on film, the silent star gave his first spoken performance in 1930's The Unholy Three, a remake of the 1925 Tod Browning film. Having officially (and reluctantly) entered the world of the talkies, 47-year old Chaney succumbed to throat cancer soon thereafter. The legacy of The Man of a Thousand Faces is an immovable thing. The son of silent screen star Lon Chaney and Cleva Creighton, Lon Chaney Jr. was born Creighton Tull Chaney in 1906, Oklahoma. Discouraged by his father from entering the acting profession, Creighton worked a wide variety of odd jobs throughout the 1920s, including butcher boy, clothing salesman, and plumber's helper. After his father's death in 1930, Creighton took his first steps towards his acting career. Both a casting director and David Selznick suggested Creighton change his name to "Lon Chaney Jr.," to which Creighton steadfastly refused. Working for several years billed as "Creighton Chaney," he finally relented in 1935 and changed his name. In 1937, Lon Chaney Jr. signed a contract with Fox Studios and worked steadily for the next three years, most notably as Lennie in the 1939 adaptation of John Steinbeck's Of Mice and Men. Chaney signed with Universal Studios in 1941 and promptly got down to business in Man Made Monster. Later that same year, Chaney Jr. created The Wolf Man (1941) and made the largest step yet in cementing his forthcoming career at Universal. Breathing life into the tortured Lawrence Talbot, doomed to unwillingly sprout hair and fangs at the first sight of a full moon and wreak havoc, Chaney was a likeable anti-hero, alternately sympathetic and menacing. The boom of the Universal horror years had begun for Chaney Jr. With quick succession, he appeared as Frankenstein's monster in Ghost of Frankenstein (1942), as Kharis the mummy in The Mummy's Tomb (1942) and as Count Dracula in 1943's Son of Dracula. Steady work kept Chaney Jr. busy throughout the rest of the '40s, including more Universal fare such as House of Dracula and Pillow of Death (both 1945). But by the end of the 1940s, the Universal horror years were coming to an end. Chaney saw work throughout the '50s in a variety of pictures including High Noon (1952) and The Defiant Ones (1958). Horror films made the occasional return for Chaney Jr. throughout the '60s (among them Roger Corman's The Haunted Palace (1963), Spider Baby (1964) and 1965's House of the Black Death). Understandably, however, the Universal glory was never recaptured. 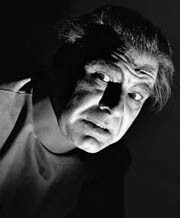 In ill health, Chaney Jr. died in 1973.